Want to promote yourself on a shoestring budget and create mountains of publicity? 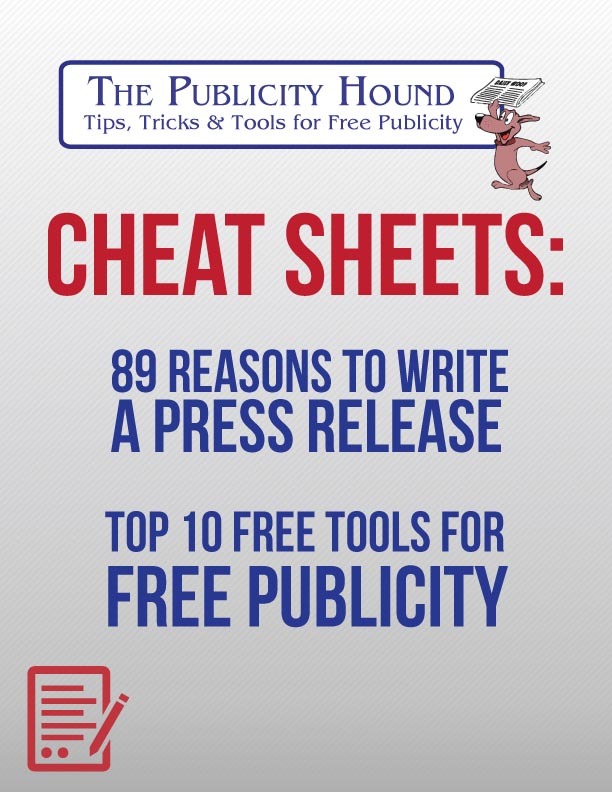 I’ll send you my Top 10 Tools for Free Publicity and 89 Reasons to Write a Press Release. Learn how to form relationships with journalists, broadcasters and bloggers and use social media to pull thousands of friends, followers and fans with compelling content. You’ll also learn how to identify story ideas about your business, book, product or service and deliver an irresistible pitch. I scour the web daily looking for the best templates, apps, checklists, videos, how-to guides — all the right tools for the right job. Many of the best ideas come from my readers. When they send me a success story, I’ll pass it along to you. Got a publicity question that’s bugging you? Email me at JStewart@PublicityHound.com and I might feature it in my tips, along with my answer. You’ll hear about free and paid online training I host, and in-person events where I share publicity strategies. Every issue includes a wild, wacky, funny or weird dog video. And always family-friendly. I hope you like my publicity tips. Let me know how I can help.